Of all the movies that we saw at the LFF in 2013, one stood out as particularly difficult to review. So difficult we both ignored reviewing it three months. Its release is now upon us however and given that it has garnered almost entirely positive reviews, we thought we better give it a review. In and out of Llewyn’s orbit circle a collection of Coen-typical characters. The Gorfein’s suffer some truly outrageous behaviour as Llewyn’s wealthy, inevitably pretentious in a good meaning sort of way, friends (and have their cat accidentally swiped into the bargain). Justin Timberlake and Carey Mulligan make a cute hipster (Jean and Jim!) singing duo couple (despite that knitwear). It’s a fun turn from Timberlake and it’s great to see Mulligan swearing and being generally angry as opposed to the sweeter side of her we are more used to. It’s fun seeing Mulligan’s potty mouthed Jean take Lewyn to pieces as he digs himself deeper into a the hole that is the fact that she is pregnant and it may well be his baby. John Goodman steals an entire road trip sequence as a particularly strange jazz manager, sporting an incredible hair piece and doing enough drugs to down a horse. All of the performances are fantastic, the cast is one helluva class act but they all just kind of float around each other in a series of appearances. That’s just how the Coens roll on this one. 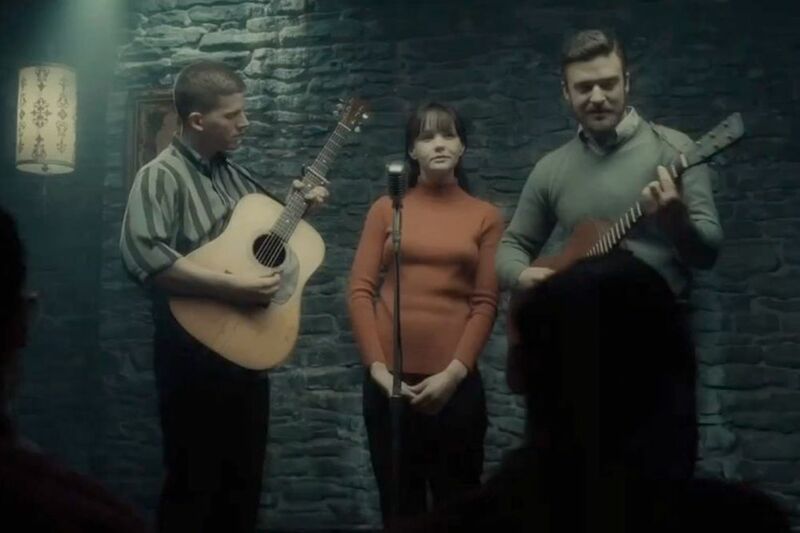 Inside Lewyn Davis is like a jazz record doing its’s own thing. The cinematography is stark and effective, capturing the bitter cold of the East Coast perfectly and the production design likewise nails the time to within an inch. So why our issue with reviewing this? Well, neither of us could decide if we actually enjoyed watching this movie or not. For some reason the sum of its parts just doesn’t seem to add up. This may be down to the folk scene not resonating on this side of the Pond or it may just be our lack of interest in that scene but by the end of the movie, we were as cold as… well, a folk singer without a winter coat. We are pretty sure that this film has a whole host of oh-so-clever film references that have sailed completely over our heads and for that we apologise but we must also admit we have no idea what the hell it is all about. Inside Llewyn Davies is a wonderful piece of work. It captures The Scene with an admirable level of detail and as with all the Coen’s work, the script whizzes along perfectly. In places it’s outright funny but the overall tone is one of plodding melancholy and it lacks the edge that the Coens captured so well in movies like No Country for Old Men and A Serious Man. As one would expect from a Coen Brothers film, the music - by the inimitable T Bone Burnett with some help from Marcus Mumford - is first rate and a treat in itself, that aspect is faultless. We’re not ones to worry about box office here at Broken Shark, have a look around the site if you doubt that, but we have to think that this movie is going to wind up being one that the critics feted whilst more or less nobody (particularly in a folk-ambivalent UK) stepped out to watch. Filled with wonderful detail and impressive performances that would be a shame but for us, this has to go down as probably the best movie that we are not entirely sure we enjoyed.